What are the advantages of having a digital inverter compressor in my refrigerator? 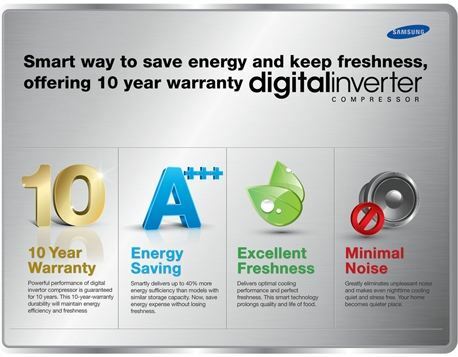 Samsung Digital Inverter Compressor intelligently varies its power and running speed according to immediate cooling requirement of the compressor. 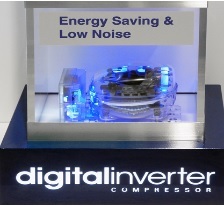 Digital Inverter Compressor works as a pump to circulate the refrigerant through the refrigeration cycle. ● It makes 5 different moving cycle based on humidity levels and usage patterns. This Compressor helps maintain a more consistent temperature as compared to Reciprocating Compressor used in Conventional Refrigerators. ● There is reduction in wear and tear on the compressor for greater durability. The Durability of Reciprocal Compressors is too low compared to Digital Inverter Compressors. ● It keeps noise to a minimum level which leads to lesser power consumption. The noise level in conventional compressor is usually high. It monitors temperature levels, making adjustments to its RPM speed, therefore, it significantly reduces noise. The efficiency of conventional compressor is low. It delivers up to 40 percent more energy efficient than conventional compressors. The use of this compressor leads to an increase in green house emmisions. The green house gases (CO2, CFC) emissions is vastly reduced thereby protecting the environment. For any assistance please contact Samsung Customer Care using one of the options below.